My Monday actually started on Sunday night. After getting back to my parents’ place I wrote the post for Sunday and packed for the seven game road trip. I left the house at 10:56 PM, stopped for gas in Janesville, and then drove four and a half hours until I reached St. Louis. I had made good time so I filled up before I went to the airport, which will make it easier once I get back from Miami. I parked in the $7 surface lot and was inside the airport by 4:40 AM. My flight took off at 6:36 and I was able to get about an hour of sleep. 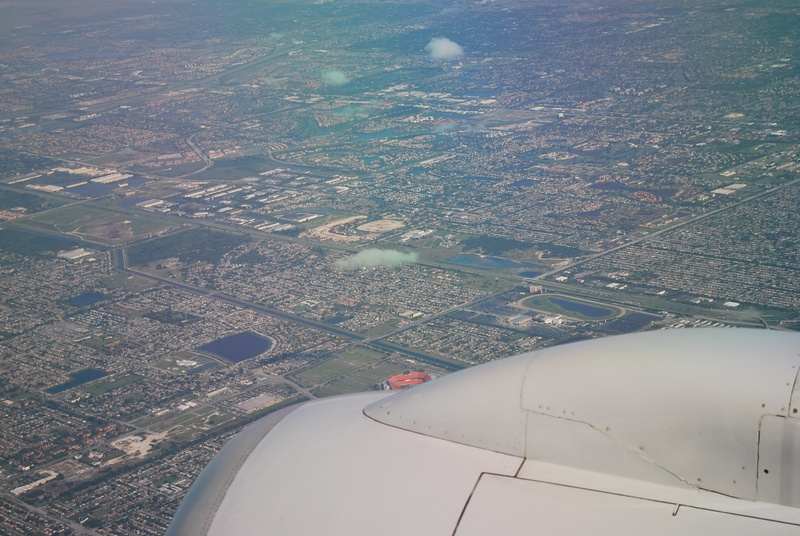 As we were over Miami I (barely) got a picture of Sun Life Stadium, which the Marlins called home from 1993 to 2011. 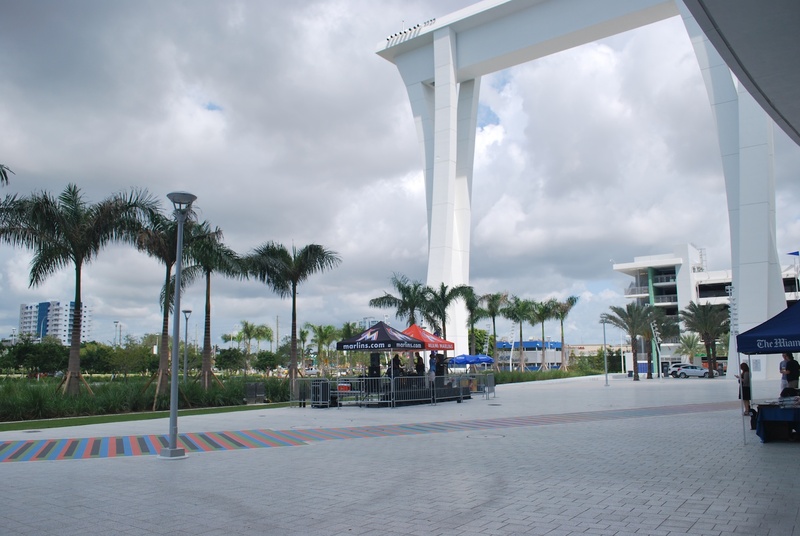 It opened in 1987 and the Dolphins (NFL) have played there ever since. It’s just above the plane’s engine if you couldn’t see it. I’m staying with my sister’s friend’s cousin (Claire) and she was planning on picking me up from the airport at 10:45 AM. I called when we landed to let her know that I was on time but at 10:35 she called back informing me her car wouldn’t start. I thought about taking the bus but opted for a taxi. The taxi was not cheap and the meter read $6.10 before we were even off of the airport grounds. It was $16.50 by the time he dropped me off 4.9 miles later but then he added $2 to the total. Long story short I found a great way to make a 20 dollar bill disappear in 12 short minutes. 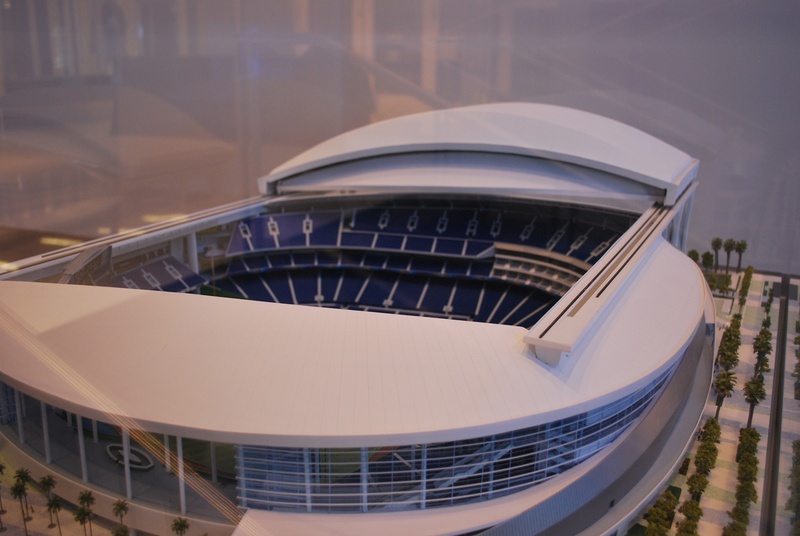 When I was dropped off at Marlins Park this was my first up close view of the new stadium. There were other letters built into the walkways and I swear I remember an O being one of them. I’m trying to think why an O would be included in their letter choice (Miami Marlins). I went all the way around the stadium and on the (western) side with the roof panel supports I took game photo number 134. A barricade pole “volunteered” its services and I used my camera’s self-timer function to get the job done. 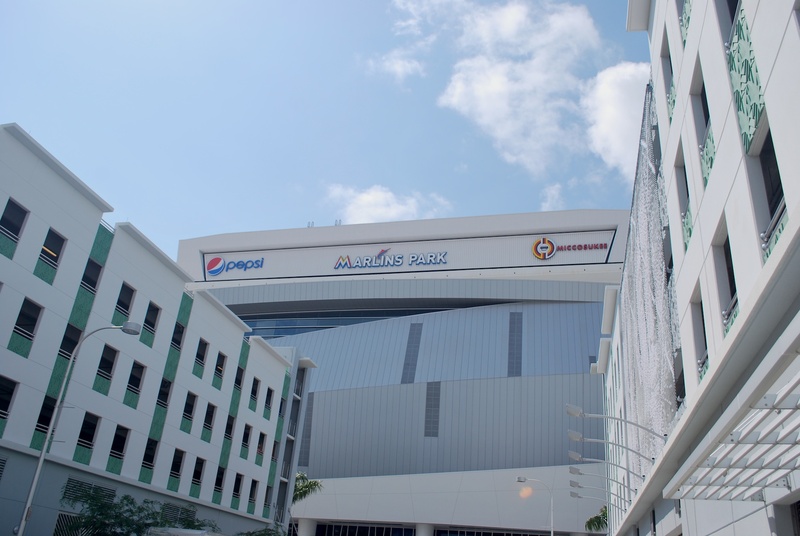 There really isn’t any exterior signage (they’re probably awaiting a suitable sponsor to shell out millions for the naming rights, Miller is taken). 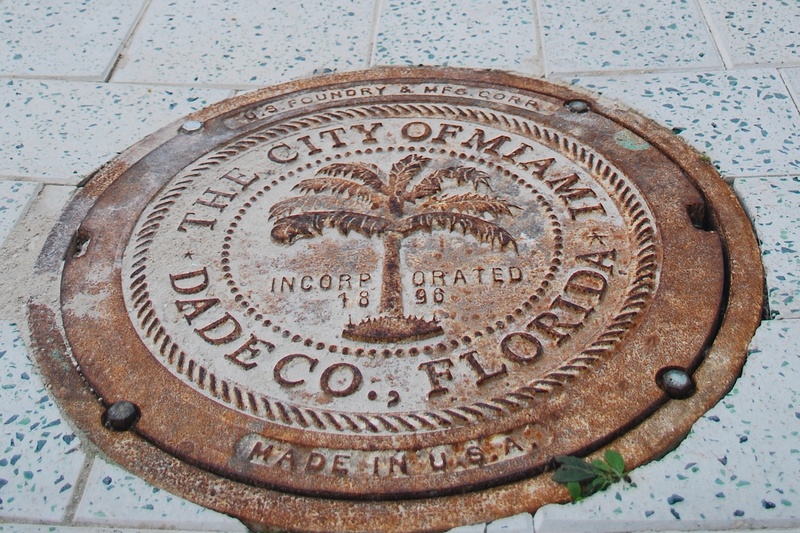 I like the man hole cover design, very tropical. I was standing on one in the game number picture so I thought it deserved a mention. Up near the stadium there was a band playing but not too many people listening nearby [read: zero]. I felt bad for the guys, it was an hour and a half before first pitch but it was dead out there. I went up to the offices and met with Angela who I had emailed several times about my visit. She had reached out to me and asked if I would like to throw out a first pitch, which I will be doing on Wednesday. 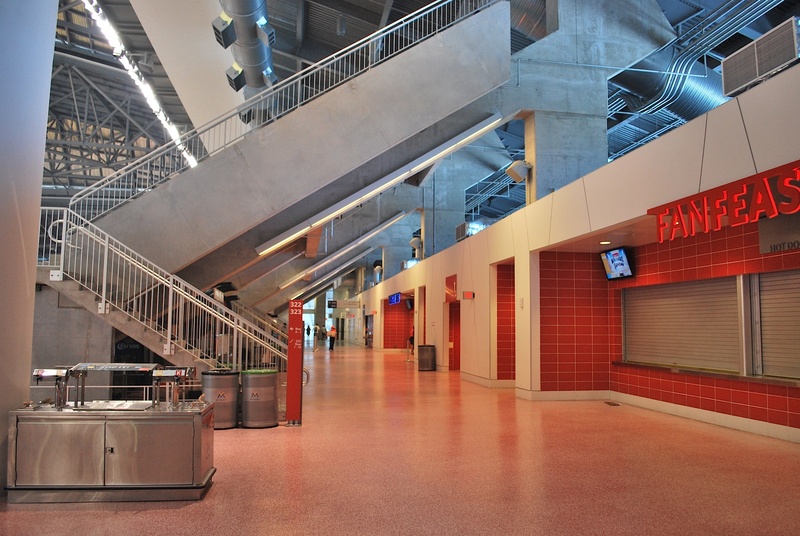 After dropping off my suitcase I headed upstairs to the main concourse. 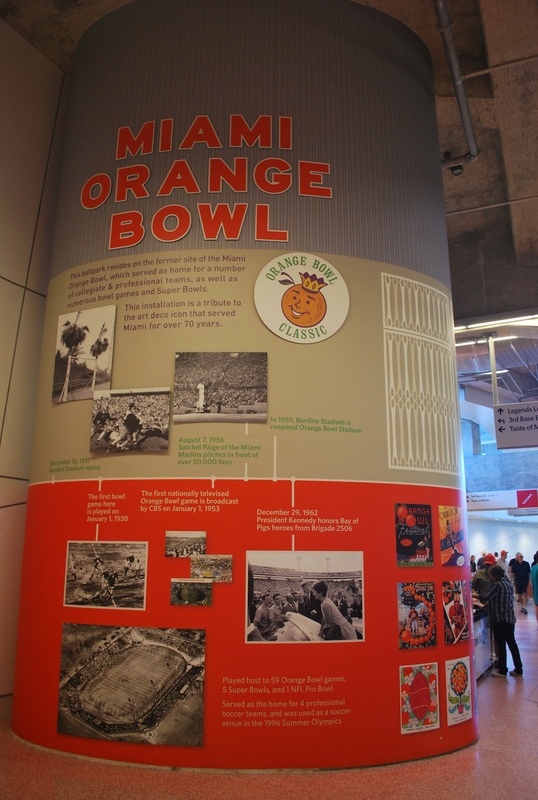 They have a pillar that details the Miami Orange Bowl’s history. It was originally named Burdine Stadium but was renamed for the Bowl Game. My Grandpa actually played in the 1948 Orange Bowl as an offensive lineman for the Kansas Jayhawks, who lost to Georgia Tech 20-14. I walked to the left field corner where they have a Taste of Miami area with local fare. 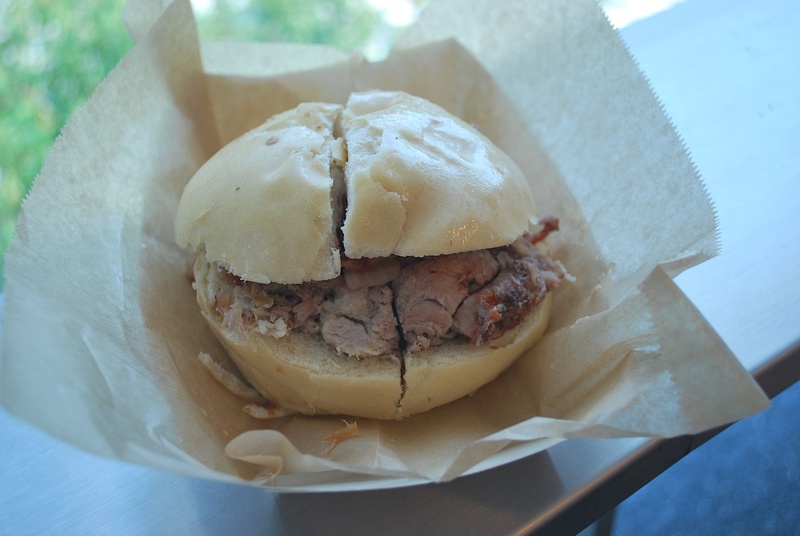 I had the pork sandwich and while it was only $7 it wasn’t spectacular by any means. I think I’ll try the Cuban sandwich during one of the other games. Not pictured is the Reyes of Sunshine smoothie I got. The Marlins have a player by the name of Jose Reyes, thus the strange spelling. It consisted of strawberries, bananas, mangos, coconut milk and agave nectar. That was also $7 but I think it was worth it. Similar to Miller Park the outfield panels can slide open. I’m hoping I can see them in action at least once during my visit. I took an escalator to the upper deck to walk around, and was surprised with how empty it was. This photo was taken 20 minutes before first pitch. It’s sad; “build it and they will come” doesn’t always hold true. Professional baseball in Florida just doesn’t seem able to attract fans. With so many other warm weather activities to take up ones time I can *somewhat* understand. 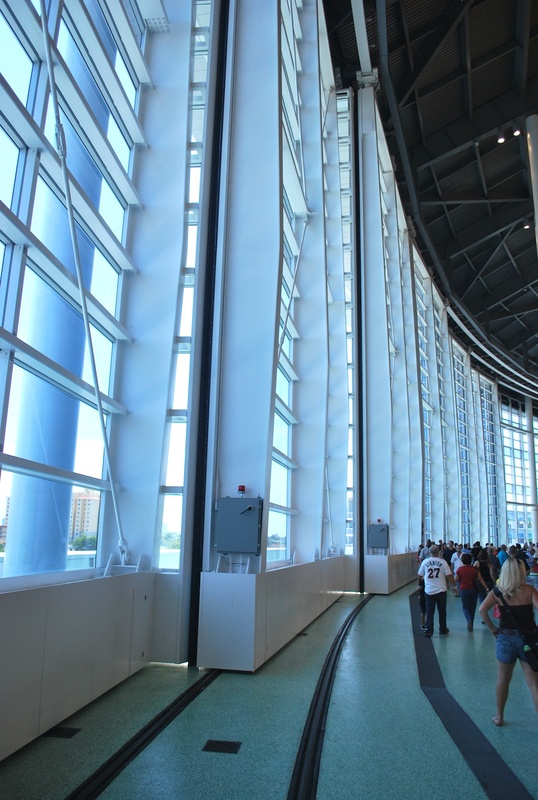 The Marlins aren’t having a very good season but I thought it would be a little bit busier, maybe because it was Labor Day people were especially busy. 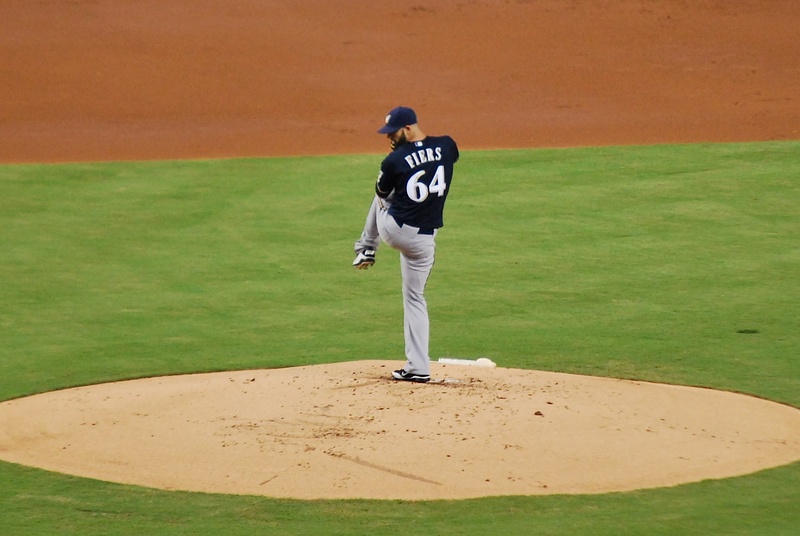 Mike Fiers, from nearby Pompano Beach, Florida, got the start for the Brewers. He had lots of friends and family in the stands and they cheered every time he threw a strike and even louder when an out was recorded. Here he is about to deliver the first pitch of his outing. 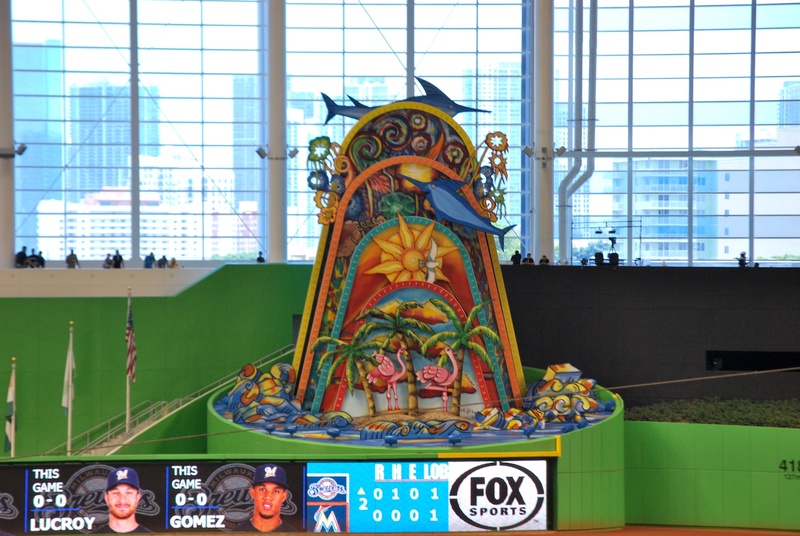 In the top of the second I took a picture of the home run sculpture that resides in left centerfield. The sculpture cost $2.5 million and while I don’t want to see it in use, I kind of do. Maybe in a Brewers blowout win or something. 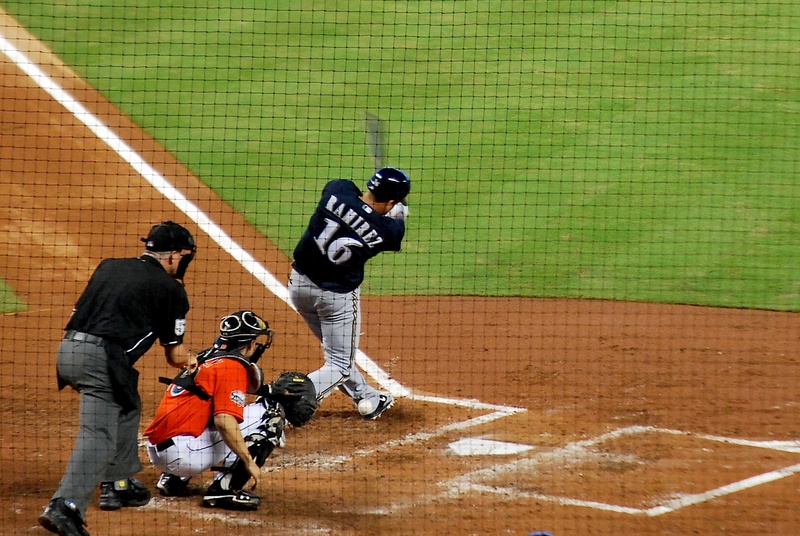 Lucroy reached on an error with one out in the 2nd and Gomez lined a shot to left that hit the top of the wall and bounced over for a two-run home run. Gomez likes to race around the bases and sometimes will almost catch his teammates that were on base in front of him. Go-Go looks like he’s hunting Lucroy down. In the top of the 3rd Aramis Ramirez fouled a pitch off his foot/ankle. If you look closely at Ramirez’s left ankle you can see his pants partially wrapped around the ball. For good measure Ram-Ram singled on the next pitch. The Brewers’ 2-0 lead didn’t last long and in the bottom of the 3rd a sacrifice fly from Reyes put the Marlins on the board. 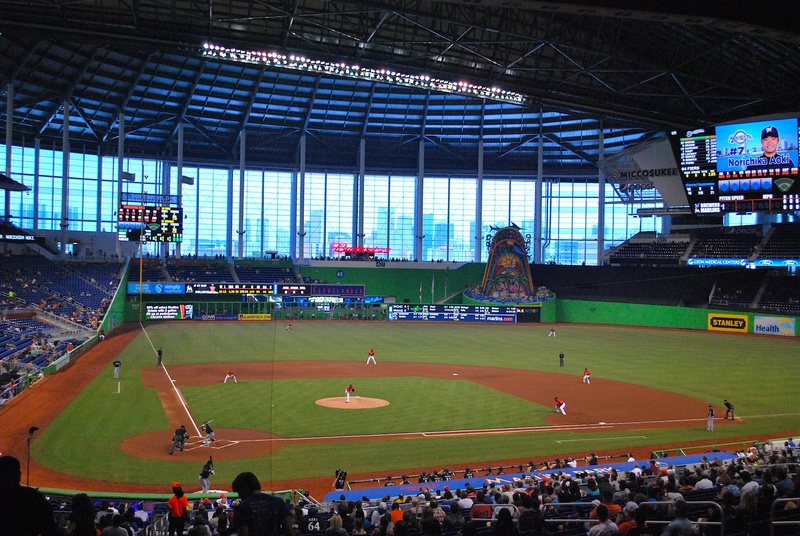 The bottom of the 4th inning was a long one, and the Marlins wound up scoring 5 runs. All of them scored while Fiers was still pitching. After facing 8 batters and only recording one out Fiers was removed for Livan Hernandez. 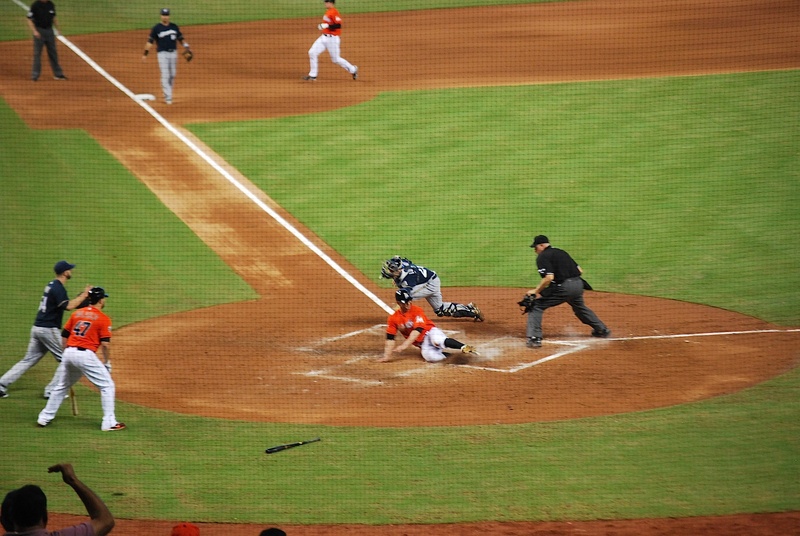 The first run that scored in the inning was almost an out at the plate but a good slide allowed the Marlins to tie the game at two, eventually taking a 6-2 lead. 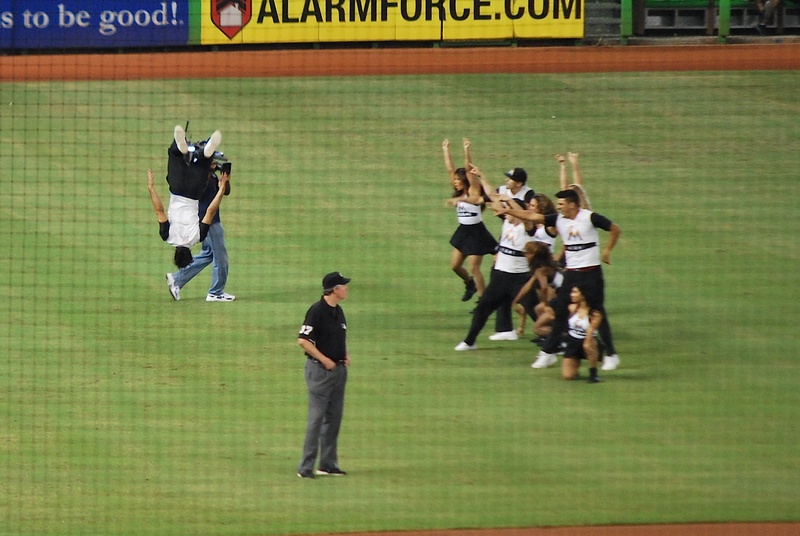 I forget when they came out onto the field but the Miami Marlins Energy Team made an appearance. I like that the umpire is keeping a close eye on the dancing, probably to make sure no rules are being broken. The guy on the left is flying!!! 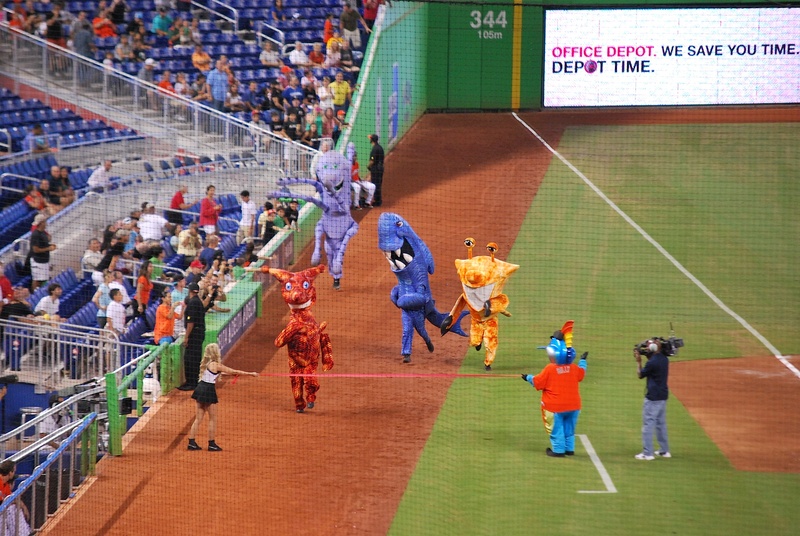 The Marlins hold a Sea Creatures race at some point during the game. It ain’t no Sausage race but like I’ve said before I may be a little biased. 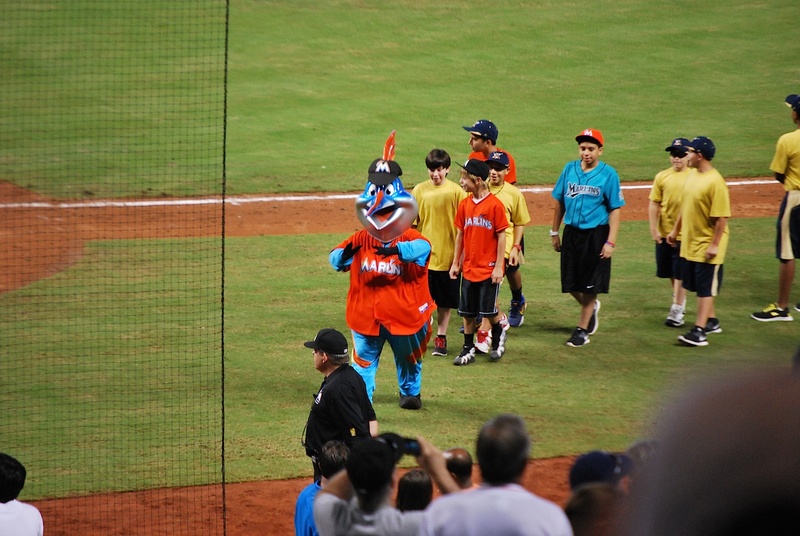 The Marlins have also modified their mascot’s attire to match the new team colors. He went from Billy the Marlin to Billy and the technicolor Marlin outfit. 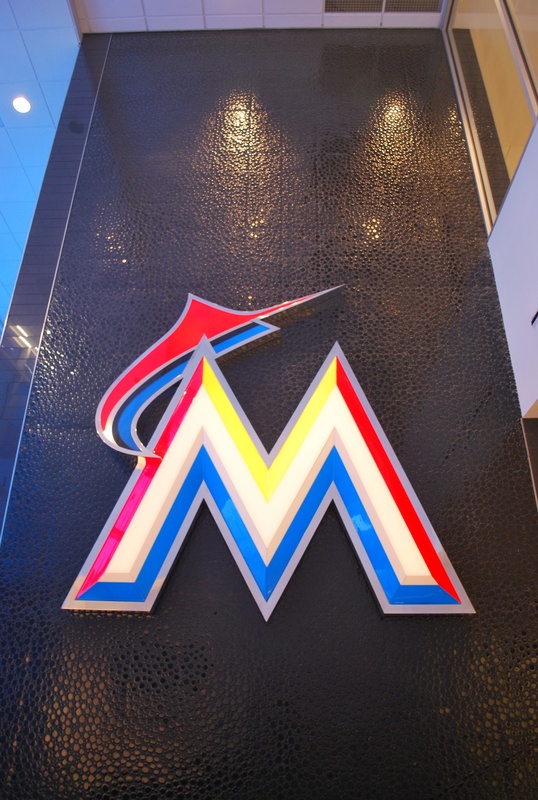 I must admit that the Marlins’ new colors and logo has grown on me. At first I didn’t really like it but if I was a fan of theirs I would wear the new team colors proudly. 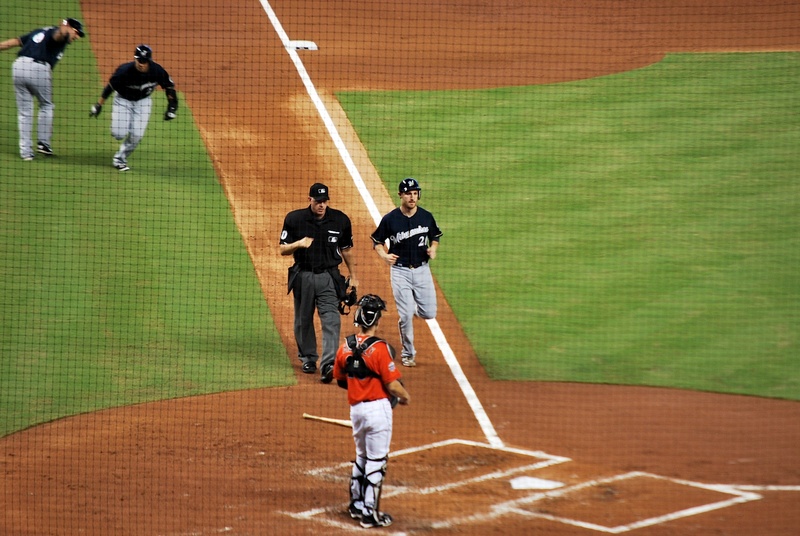 Braun drove in a run with a single in the 6th but the Marlins added a run of their own in the bottom of the 7th. 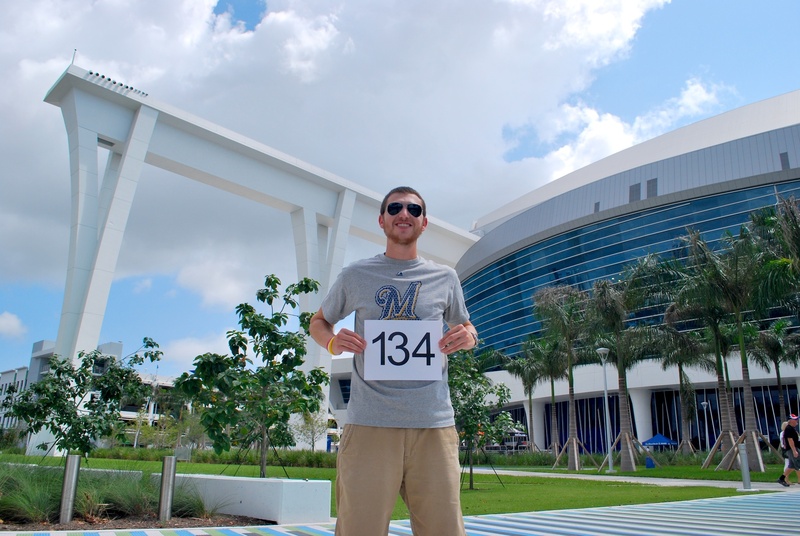 The Brewers outhit the Marlins 10-7 but lost by four runs. 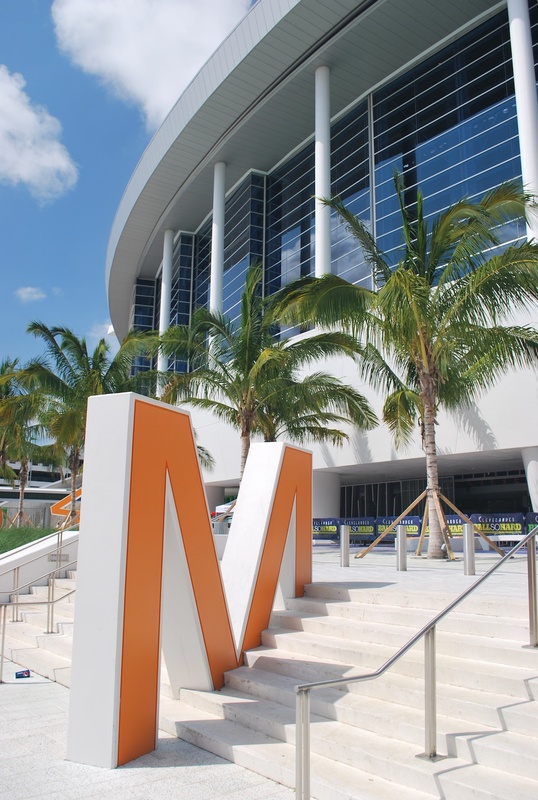 Final Score: Marlins 7 – Brewers 3. 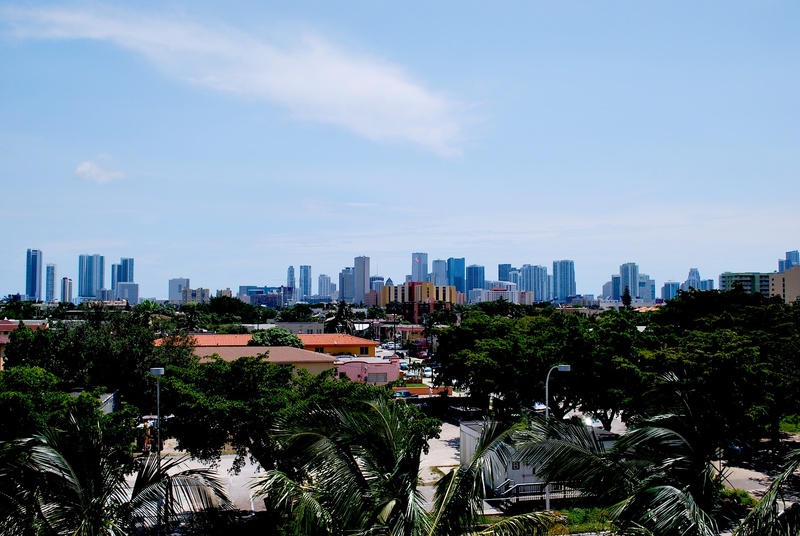 I took the 7 bus to downtown Miami and walked the half mile to my hosts apartment on Biscayne Boulevard. The view from her apartment on the 44th floor is amazing, and even cooler at night (not pictured). 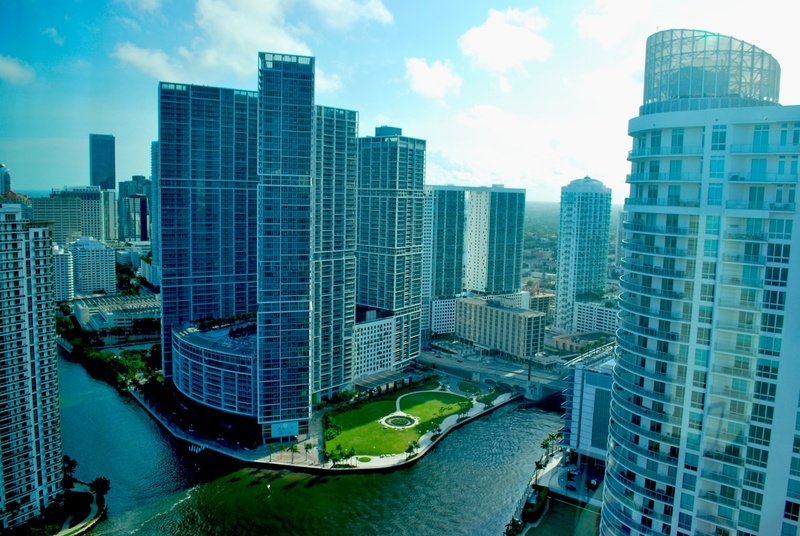 The Miami River is the body of water that is visible and if you could see to the left in this picture you would see it open up into the Atlantic. I slept for a few hours when I made it to the apartment and then worked on the post for the day. It’s 10:30 AM on Tuesday as I write this and I’m heading to the beach in a bit. Oh, I almost forgot: my 2,152 pitch streak came to an end on Monday. Livan Hernandez was pitching for the Brewers and working quickly. I was looking at the scoreboard in the bottom of the 5th and missed the first pitch to Donnie Murphy. I had just been thinking that I had been saved by my peripheral vision a few times during the game. I hadn’t been paying attention but the pitcher’s wind up caught my attention and I was able to refocus. Not so much in the 5th, oh well.